Friend jus finished rapping his pair and they seem to be softer then the 1st gen. I think he throw 4-5oz with um but he still can bomb um. The theee piece is super convinient though. Right on thanks for replying. A little softer is ok with me, as long as it can still be blasted out there like the 1st gens can. I do like the convenience of the 3 peice, but i was worried it would alter the taper when compared with the 1st gens. Also, another thing I was wondering was if these were available in high modulus as well? The three piece blank comes in regular and 3XXML power. Got both blanks, just need to wrap them. 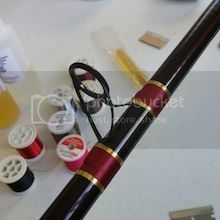 The regular blank should be able to handle 2 to 4 oz lead, 15 to 25 lb line. Should be good with a reel size like the 220 or 229 Newells. This blank didn't have a line or lead weight rating. The 3XXML blank is rated at 20 to 40 lb test and 5 to 6 oz lead. Both blanks take a size 22 reel seat.